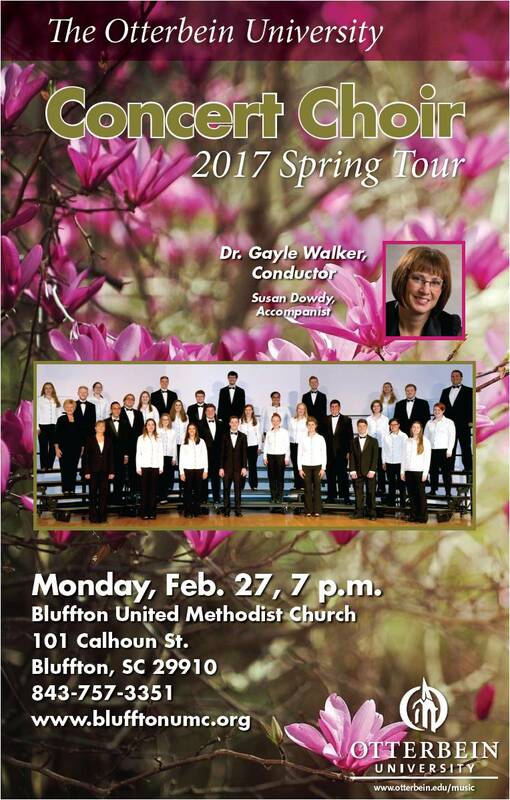 The Otterbein University Concert Choir, under the direction of Dr. Gayle Walker, will perform at Bluffton United Methodist Church on February 27, 2017 at 7PM as part of the choir’s southern spring tour. The concert is free and open to the public. A freewill offering will be gratefully appreciated. The Otterbein University Concert Choir from Westerville, Ohio will travel to Savannah, Georgia Feb. 24-March 3 for the choir’s annual performance tour. The choir will perform in Norwood, VA; Charlotte, NC; Beaufort, SC; Bluffton, SC; Atlanta, GA; Nashville, TN; and Westerville, OH. All performances are free and open to the public. The choir’s conductor, Dr. Gayle Walker, and Tour Manager and Accompanist, Susan Dowdy, began planning the tour in April, 2016. In late August, 2016 the choir began rehearsing music for the tour. The Choir Co-Presidents assist with choir organization throughout the year as well as tour planning. The Concert Choir is the most select of Otterbein University’s vocal ensembles. The choir tours annually to destinations both domestic and abroad. Recent itineraries have included Boston in 2016, Ireland in 2015, Chicago in 2014, New Orleans in 2013, Philadelphia in 2012; and China in 2011. The choir has performed at prestigious locations such as the Beijing Conservatory of Music, Notre Dame Cathedral in Paris, St. Stephen’s Cathedral in Vienna and St. Nicholas Church in Prague. The ensemble frequently performs at professional conferences, including conferences of the American Choral Directors Association and the Ohio Music Educators Association. Bluffton United Methodist Church, in Old Town Bluffton, is located at 101 Calhoun Street. The church is handicap accessible and free parking is available. Concert Choir is the most select of Otterbein University’s five vocal ensembles. The choir tours annually to destinations domestic or abroad, with recent itineraries including Boston, Ireland, Chicago, New Orleans, Philadelphia, and China. The choir has been invited to perform at prestigious locations abroad such as the Beijing Central Conservatory, St. Patrick’s Cathedral in Dublin, Notre Dame Cathedral in Paris, St. Stephen’s Cathedral in Vienna and St. Nicholas Church in Prague. Concert Choir has performed frequently at conferences of the American Choral Directors Association and the Ohio Music Education Association. Otterbein University is a private, co-educational, comprehensive liberal arts institution founded in 1847 and affiliated with the United Methodist Church. It is located in Westerville, Ohio, a suburb of Columbus that has been ranked the 5th friendliest town in America by Forbes and Nextdoor.com, and 15th on Money Magazine’s 2009 list of Best Places to Live. Otterbein enrolls approximately 3,000 students, including full and part-time undergraduates, adult learners, and students enrolled in the Graduate School. Otterbein offers over 70 majors, as well as individualized fields of study. Master’s degree programs are offered in allied health, business administration, education, educational mathematics and nursing, including courses in its newly-accredited nurse anesthesia program in conjunction with Grant Medical Center. Otterbein has consistently placed high among peer institutions in U.S. News & World Report’s “Guide to American’s Best Colleges” for over a decade. The Otterbein University Department of Music offers degrees in Music Education (BME), Music Performance (BM), Bachelor of Arts with a Major in Music (BA), and Bachelor of Arts with a Major in Music Business. In addition to its choral program, the department has a full complement of bands, orchestras, and active programs in jazz and opera. The Department of Music is a fully accredited member of the National Association of Schools of Music. For more information about the department, including audition materials, please contact either Chairperson Dr. Dennis Davenport, or Program Manager Claire Brock at cbrock@otterbein.edu, or by calling 614-823-1504. Dr. Gayle Walker is in her seventeenth year as Director of Choral Activities and Professor of Music at Otterbein University in Westerville, OH, where she is responsible for the organization of five vocal ensembles, conducts Concert Choir and Opus One a cappella/jazz ensemble, and teaches classes in conducting, aural skills, and music history. Dr. Walker has recorded six CDs with Concert Choir, and composed two song cycles for the ensemble, A Spherical Suite and Three Songs On the Poetry of Paul Laurence Dunbar. A native of Iowa, Dr. Walker received her Bachelor of Music degree from Macalester College, a Master of Music degree from the University of Colorado, and a Doctor of Arts degree from the University of Northern Colorado. She studied choral conducting with Dale Warland and Lynne Whitten, and orchestral conducting with David Mackenzie and Howard Skinner. Additionally, she has studied composition with Libby Larsen.